A year ago, after publication of an item in this column titled “Jim Wynne, Volvo, and History of the Sterndrive” (PBB No. 161), New Zealander Peter J. Morgan wrote to say that credit for invention of the aforementioned should properly be credited to then MIT student Charles Strang, and not to Jim Wynne. The year, he wrote, was 1948. Of additional interest, Morgan described working in 1968–69 as a “young engineer” for Thunderbird Products Corp. in Miami, Florida. 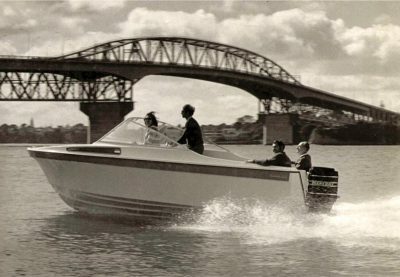 A young Peter Morgan designed and built what he says was the first composite sandwich boat in New Zealand, the 20′ (6m) Aurora, cedar-stripped and sheathed with fiberglass and epoxy resin. 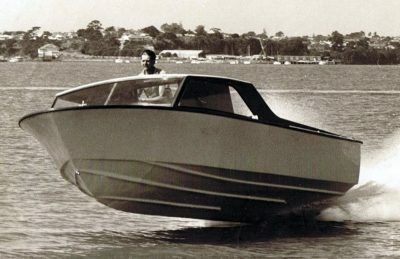 “The most powerful outboard then available was the Mercury 140, which was by today’s measure of prop shaft power, about 135 hp. The longest outboard shaft length then available was 20“ [508mm], so the use of a rear flooding compartment to sink the original 25°-deadrise hull down to its chines was out of the question, as the powerhead would have been far too close to the water surface. My solution was to modify the hull bottom by adding a long wedge along each chine flat, lowering the chines at the transom by 76mm [3“], and warping the section of bottom between the outside edge of the outer spray strake and the inside edge of the chine flat. Thus the deadrise on this outer section of bottom reduces progressively from 25° midships to 2° at the transom, giving an overall deadrise at the transom of 20°. My idea was to gain acceptable stability at rest, with single outboard power. Also, I raised the topsides by about 150mm [6“], incorporating a knuckle where the original gunwale had been. This allowed me to design a very low-profile cuddy cabin that people say still looks modern to this day. Although it looks low, there is full sitting headroom on the bunks for me, and I was 6‘ 51⁄2“ [1.97m] back then. To make the Morgan 6•3, Aurora was modified by adding a wedge along the chine flat and warping the bottom of the plug. At 75 Morgan is still actively working, specializing in the forensic analysis of marine engines and heavy-truck mechanical failures.